BAFTA Scotland celebrates its birthday this week, 30 years on from its inaugural screening of The Mission at the Glasgow Film Theatre. 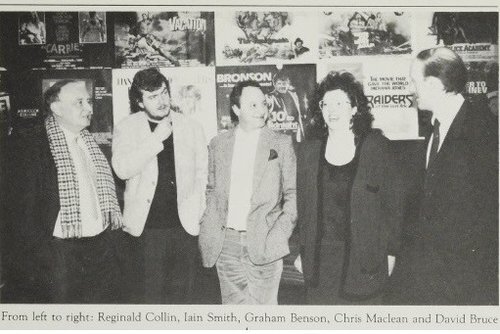 30 years ago on 7 December 1986, Reginald Collin, myself, Graham Benson, Chris MacLean and David Bruce met at the Glasgow Film Theatre for the inaugural BAFTA Scotland screening of The Mission. It is reassuring to consider how far we’ve come this past 30 years or so. Back in the 1970s I was part of a small group of Scottish filmmakers who gathered over numerous pies and pints to plan ways to make ‘real’ films. Making films about whisky distilleries, suspension bridges and sunsets over the Western Isles, devoid of real people, was bad for our collective soul. In those days the notion of having a film industry that made feature length films about things that mattered was little more than a daft wee dream. The two most prominent film organisations at the time, Films of Scotland and the Scottish Film Council, had no energy for such things. They seemed to be resigned to the plodding status quo. We, on the other hand, more in hope than expectation were putting our thrawn suspicions to one side, and were starting to move forward in a collective spirit that had never existed before. It was that spirit that gave rise to events like ‘Filmbang’ in 1976, and the ‘Cinema and the Small Country’ conference in Edinburgh the following year. The participation of filmmakers from other countries, similar in size to our own, raised the level of debate, and made us realise that our situation wasn’t so unique after all. And, guess what, we began to realise we might actually be better than we first thought. The most significant change happened, of course, when Bill Forsyth, in sheer frustration having had Gregory’s Girl turned down yet again by the Scottish Film Council, steamed ahead, with no money whatsoever, and made the now legendary That Sinking Feeling. Frustration overcame his native caution, and he jumped into the void. He just started - making a film. In doing so he gave birth to a distinctly Scots point of view that matured in Gregory’s Girl and later in Local Hero. He not only brought our national sense of the absurd to a wider screen audience, he also proved that a Scottish based filmmaker could be seen as a world class talent. He pointed us in a direction that has since been pursued by our most talented people. But above all he showed us that we should sometimes “just get on with it”. So from these hesitant beginnings, the formation of BAFTA Scotland in 1986, was a moment of great significance; proof that our daft wee dream was becoming a reality. Scotland’s filmmakers were at last being recognised, and applauded, for their risk taking creativity, and for asserting themselves increasingly on the wider cultural landscape. It is an old Hollywood truism that ‘money follows talent’. I have no doubt that the existence of BAFTA Scotland and its celebration of our country’s talent over these many years has already improved the creative and financial fortunes of our people. I have no doubt that BAFTA Scotland through the recognition of homegrown role models, continues to build confidence in our young by bringing their achievements to wider notice and acclaim. BAFTA Scotland has significantly improved their chances of engaging with international opportunity and investment. But alongside that, the development of a sustainable industrial/commercial infrastructure in Scotland must not be forgotten. Without that, our skills and talents will not be sustainable beyond these shores. We need a robust business environment within which our creativity, and culture, can captivate the world. This of course requires continued, and increasing, strategic resourcing from the Scottish Government. But, in the spirit of Bill’s ‘just get on with it’ approach, support from the hard-pressed public purse will never be enough. A fully functioning and healthy industry cannot be built from protective subsidy alone. It has to come from the uneasy conjunction of risk art and risk money. In Scotland we have plenty of one, and not a lot of the other. There is plenty of risk investment in the world, looking to exploit innovation and creativity. It’s just not here - yet. The demand for filmed entertainment is growing worldwide, and if we work hard with an increasing number of delivery systems, our content can reach an ever widening audience like never before. To do this we filmmakers must continue to forage further afield for new markets for our work. It is essential to keep improving our entrepreneurism, to build networks of respect, trust and friendship outwith our homeland. We Scots are internationalist by instinct and we should make the most of that in these disruptive, opportunistic times. Talent begins the process; money enables it, and skills achieve it, but only within a more effective and joined up industrial system. So our daft wee dream is coming yet for a’ that. But at least we’ve proved what it can achieve.